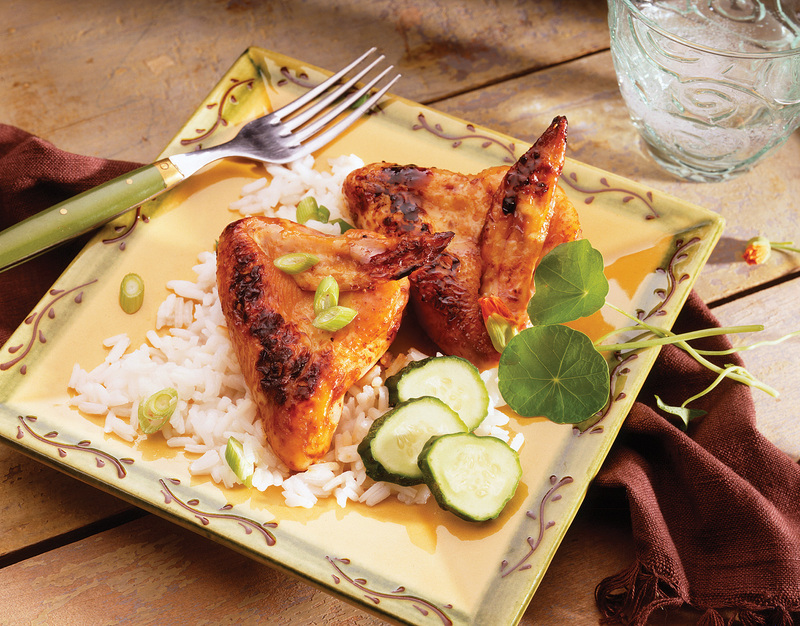 These wings with a marinade glaze of ginger, soy sauce, and orange marmalade are tasty as appetizers or as a main course. Combine all marinade ingredients in small bowl. Pour half of mixture into a container; cover and refrigerate until cooking time. Pour remainder of mixture into a zip-seal plastic bag. Add chicken and seal bag. Refrigerate, turning bag occasionally, for at least 30 minutes or for up to 24 hours. When you are ready to cook, remove chicken from bag. Discard marinade. Heat oil in a large skillet over medium heat. Add chicken, turning occasionally, for about 10 minutes or until chicken is browned. Add marinade from refrigerated container and orange juice. Bring to a boil. Reduce heat to low; cook, partially covered, for about 15 to 17 minutes or until sauce is caramelized and chicken is thoroughly cooked. Transfer wings to serving platter. Pour sauce over wings and garnish with green onions. When buying fresh ginger, look for firm, irregularly shaped rhizomes with smooth brown skin and no soft spots. Store at room temperature and use within a few days. To serve the wings as a main course, accompany with sesame rice and steamed asparagus spears.